All of our Economical Outdoor signboard options have proven the test of time to be weather resistant for long term use. The difference between them is how and where they will be mounted and the appearance you require. Aluminum .040: Great economical option for light duty road, parking lot or building sign applications. Lightweight and durable, non-rusting, has some flexibility in larger sizes. Corners can be rounded upon request. PVC (½" approx. ): Our most popular signboard! A solid finished edge makes this ideal for many indoor/outdoor applications. 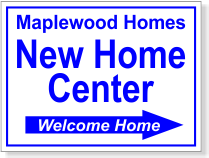 Ideal for use as a 1 or 2 sided sign. This building grade PVC board is used as fascia and trim on buildings and homes. UV stabilized, rigid and durable. Equivalent weight to plywood. Alupanel (⅛" approx. 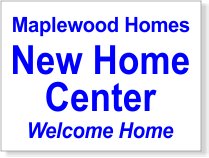 ): Great for smaller indoor and outdoor signs installed anywhere and larger signs that have frames. 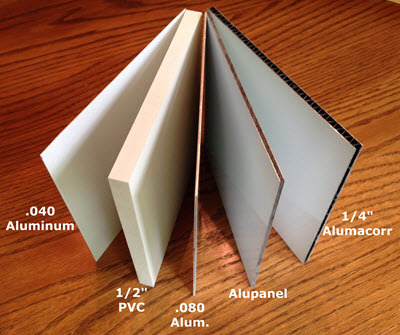 Aluminum composite board (Solid polyethylene core sandwiched between 2 aluminum skins) Lightweight and durable, non rusting, has some flexibility in larger sizes (more rigid than the .040 aluminum). Corners can be rounded upon request. Aluminum .080: Best for long term signs that are mounted on a single post. Comparable material to many speed limit and stop signs seen on the roadsides everywhere. Lightweight and durable, non rusting, has some flexibility in larger sizes. Twice the thickness and weight as the .040 aluminum. Corners can be rounded upon request. Alumacorr (¼" approx. ): A sturdy and rigid signboard recommended for our larger sign sizes. Aluminum composite metal sign panels permanently bonded to both sides of a high density, corrugated plastic core. The aluminum sides provide rigidity and durability to the sign, while the plastic core makes Alumacorr a heavy duty, yet lightweight sign panel. Using an AlumaCorr Sign gives you a perfect option for outdoor applications, as it will not swell or corrode from the inside. 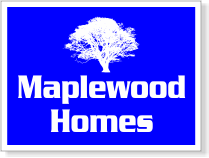 Ideal for use as a 1 or 2 sided sign. Lightweight and durable, non-rusting. Weather resistant, great for indoor or long term outdoor applications. Most rigid of our signboard options. Sizes shown in BLACK: FREE SHIPPING applies via FEDEX ground (on orders over $100). Sizes shown in GOLD: FREE SHIPPING applies. To be able to ship via FEDEX ground, these size signs are available in 2 sections as shown. You simply mount them side by side (not recommended for 2 sided signs). Looking for larger sizes? Check out our Super-Sized Economical Outdoor Signs. White powder coated aluminum sign brackets - non rusting. Brackets mount on the edge/corners of your sign. Designed to "hold" your sign between 2 vertical posts. Not designed to mount your sign flat to a wall. 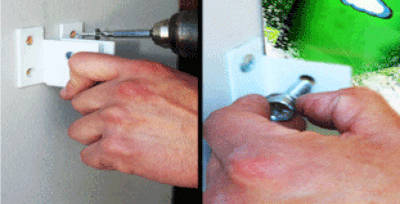 Use stainless steel screws/bolts to secure (not included). Mounting brackets are only available for Alumacorr and PVC signboards. Approx 5 times stronger than traditional VELCRO. A clear acrylic super strong VHB adhesive on the back of a clear polypropylene reclosable fastener. Low Profile ⅛” inch engaged thickness. Designed to bond your sign to metals, glass, many plastics and powder coated paints (not designed for freshly painted latex walls). 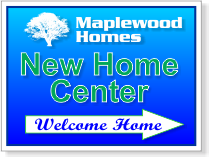 Designed for most 1-sided signs and can be used to support all signboard options shown on this page. Sold in a set that contains four 1” pieces. 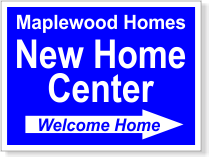 Order several sets to support larger/heavier signs. Stainless steel hanging hardware to hang our small Outdoor Signs. Each set includes 2 regular sized pad eyes/screws and chains to hang. Hanging hardware is only available for our small PVC signboards (sizes shown in black above).